I didn’t want to go to jail ministry the other night. I was just having a bad day and a bad attitude. I didn’t know what I was going to say to those ladies. When God gives me a word, I know it. I feel it. It flows. But when He doesn’t, I might as well keep my mouth shut because I have nothing. But I have learned through experience that we don’t always do things or not do things based on our feelings. I teach this message to my students all the time. It was time to live what I preach. I’m so glad I did. I saw a girl there that I had gotten to know last time, and she was so excited to share with me. She had been reading her Bible. She flipped through it and showed me all the places she had highlighted. She shared with me all the things she had been learning. She shared her struggles, her heart, her goals, and ambitions. Then she shared something that had a profound effect on me. She said her dad had a massive heart attack a few months back. He had surgery and was recovering. He was always faithful to visit her. On one of his recent visits, after his heart attack, he told his daughter this. Wow! What a harsh word from a dad to his daughter. Tears streamed down her cheeks as she shared that with me. But she admitted that those words were truth, truth that was certainly hard to hear, but truth that had sunk deep into her heart. She was determined to stop wasting her life. God never ceases to amaze me. He didn’t give me a message to share that night. He gave my friend in jail a message—a powerful message. I didn’t go to speak that night. I went to listen–to listen and to learn. We all want our lives to count. We get one shot. One life to live. One chance to make a difference. This has been the overarching message I think the Lord has been trying to teach me this year. I have wasted so much of my life on so many worthless things. We take nothing with us from this earth into eternity. We build up these so-called treasures on earth, and when we die, we go, but they stay. Life is short–very short. And it is racing by with rapid speed that seems to get faster and faster every day. What are we doing here on earth that will have value in eternity? Sure, some waste their lives on obvious things like addictions and sinful habits. But what I am starting to realize is that I have been wasting my life, on not just bad things, but on GOOD things. Yes! We can waste our lives on good things. We can be involved in church, super ambitious at our jobs, be good neighbors and good friends, even be well liked and respected, and still be wasting our lives. If our main goal, our heart’s passion, our sole pursuit in life, is not actively pursuing a relationship with Christ–to know Him and love Him in everything we do–then it’s a waste of time and has no eternal value. Paul was not a drug addict or notorious sinner before he got saved. He was the Pharisee of Pharisees. He was a spiritual leader in his community. He knew the Word inside and out. He had strict rules he followed and was very disciplined. He had clout with other Pharisee leaders. He had a strong family background. These aren’t bad things. They are good things. 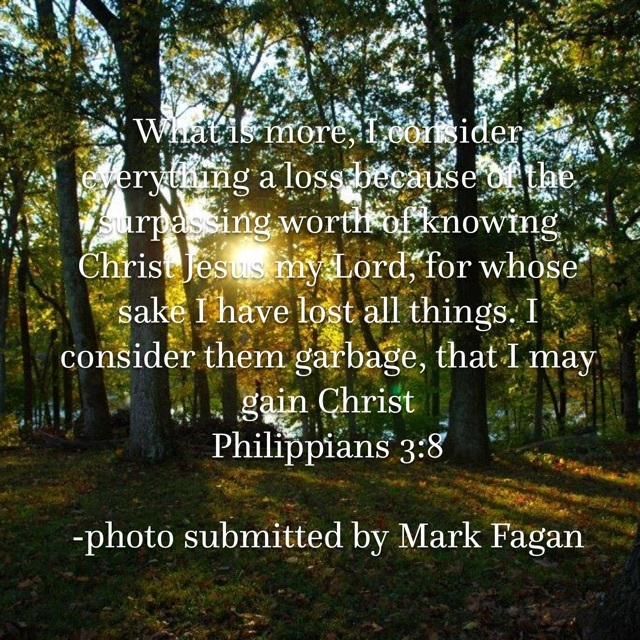 Yet, read what he said in Philippians 3:8. He considered everything—everything—yes, everything–loss compared to the value of knowing Christ. He said that he had suffered the loss of all things—all things—all things—and considered all those things filth (worthless—a waste), so that he might gain Christ. Now don’t get me wrong. Those good things we do CAN have eternal value–If HE is the driving force behind all we do. If knowing Him, loving Him, and making His name known is at the heart of all we do, then yes, our lives will have great purpose and eternal value. I am so moved and convicted by a message from a jail cell. I don’t want to waste my life. Note: Some of the material I shared came from an awesome sermon by Pastor David Platt called “Don’t Waste Your Life (Part 1).” It is a very strong and convicting sermon. Check it out on the link on the blog if you get a chance. I know you will be blessed. Rachel, I love this blog…I receive it and read it every day. I didn’t realize “Rachel” was YOU! What a blessing! Nailed it!!!!! Wow, I love this.